HP Umpire Greg Gibson ejected Nationals LF Juan Soto and Hitting Coach Kevin Long (strike three call from an earlier at-bat; QOCY). With none out and none on in the bottom of the 6th inning, Soto argued balls and strikes from an earlier at-bat with Gibson as he stepped into the batter's box, resulting in ejection. In the bottom of the 4th inning, Soto led off the frame by taking a 3-2 slider from Braves pitcher Mike Foltynewicz for a called third strike. Replays indicate the pitch was located over the inner edge of home plate and above the hollow of the knee (px .842, pz 1.602 [sz_bot 1.565]) and that all pitches during the at-bat were properly officiated, the call was correct. *^' At the time of the ejections, the Braves were leading, 7-3. The Braves ultimately won the contest, 8-3. These are Greg Gibson (53)'s third and fourth ejections of 2018. Greg Gibson now has 7 points in the UEFL Standings (3 Prev + 2 MLB + 2 Correct Call = 7). Crew Chief Jerry Layne now has 6 points in Crew Division (5 Previous + 1 Correct Call = 6). *The strike three pitch was located 0.876 horizontal inches from being deemed an incorrect call. ^UEFL Rule 6-2-b-5-b, formerly the DiMuro Rule, was eliminated during the 2015 UEFL Rules Summit to allow for QOCY/N determination regardless of when in the game the ejection occurred. 'Soto's ejection falls under both the leaving one's position to argue balls and strikes and reference to/contradiction of an earlier call Standards for Removal from the Game. This is the 112th and 113th ejection report of the 2018 MLB regular season. This is the 54th player ejection of 2018. Prior to ejection, Soto was 0-2 (SO) in the contest. This is Washington's 5/6th ejection of 2018, 1st in the NL East (WAS 6; NYM 5; MIA 3; ATL 2; PHI 0). 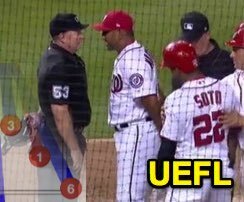 This is Juan Soto's first career MLB ejection. This is Kevin Long's 2nd ejection of 2018, 1st since July 23 (Nic Lentz; QOC = Y [Balls/Strikes]). This is Greg Gibson's 3/4th ejection of 2018, 1st since July 14 (Brandon Belt; QOC = Y [Check Swing]).